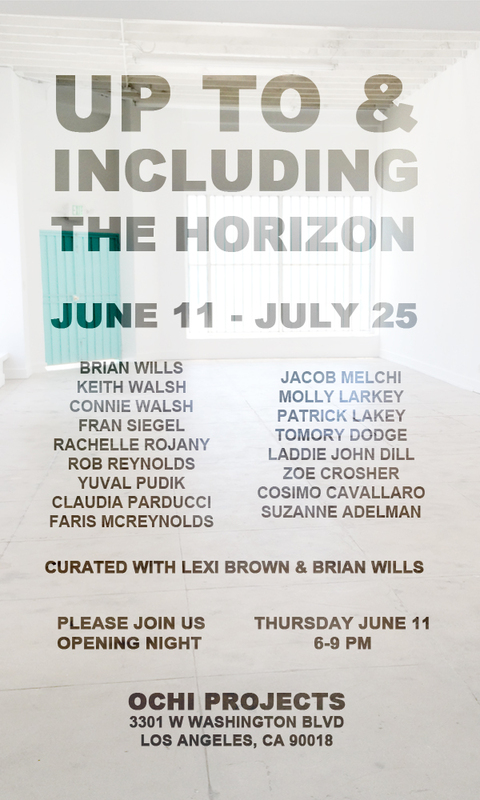 OCHI PROJECTS is pleased to present its inaugural exhibition Up to & Including the Horizon curated with Brian Wills and Lexi Brown. Horizon line is so inherent to the picture plane that most viewers might take for granted how artists integrate it into their work. In fact, if you look up the definition you get explanations such as “it is essential for an image to have a horizon line, even if that horizon line is not obviously apparent to the eye.” The horizon line is a concept almost so rudimentary to the act of creating a picture that using it as the basis for an exhibition is both straightforward and prohibitive. Some artists, such as Tomory Dodge and Jacob Melchi use the horizon line as a formal device to create abstract images. Wills’ use of a vertical horizon acts as a perceptual zip line, transporting the eye through an imagined depth within the work. Other artists, however, revealed that the horizon line is not only a tool, but is essential to the reading of a work. Suzanne Adelman and Patrick Lakey consider it as a backdrop for supporting narrative. Others, like Keith Walsh and Zoe Crosher examine it as a marker of time and use it to convey chronology and history. Fran Siegel’s Quatorze recognizes it as a mechanism to connect two points. And others like Molly Larkey and Cosimo Cavallaro’s three dimensional works signal the horizon using material, volume and negative space. The result is a meditation on horizon across mediums and meanings. Explicit or suggested it’s as pervasive an idea in art as in life, providing an anchor and space for possibility.